Heat oven to 350°F. Grease bottoms and sides of three 9-inch round cake pans with shortening; lightly flour. In medium bowl, mix 2 2/3 cups coconut, 1 2/3 cups powdered sugar, 1/4 cup butter, 2 tablespoons hot water and 1 teaspoon vanilla with spoon; divide evenly into 16 pieces. Shape each piece into bar, about 1 1/2 inches long. (Mixture will be sticky; butter hands if desired.) Place bars on waxed paper. In medium bowl, beat egg whites and cream of tartar with electric mixer on high speed until stiff peaks form; set aside. In another medium bowl, beat 2 cups granulated sugar, 1/2 cup butter and the shortening with electric mixer on medium speed, scraping bowl occasionally, until fluffy. Beat in egg yolks, 1 at a time, beating after each addition until blended. Beat in 1 teaspoon vanilla and the coconut extract. In small bowl, mix buttermilk and baking soda until baking soda is dissolved. Alternately add flour and buttermilk mixture to sugar mixture, beating after each addition until smooth. Stir in almonds and 1 cup coconut. Fold in egg whites. Pour into pans. In medium bowl, beat all filling ingredients with electric mixer on medium speed until smooth. Fill layers with filling. 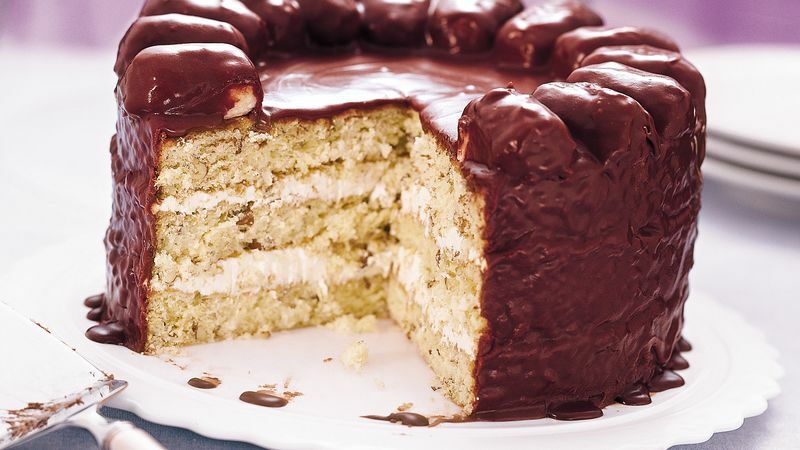 Arrange candy bars evenly around edge of cake; cover and freeze at least 2 hours. In medium bowl, mix all frosting ingredients except 1/3 cup hot water with spoon. Stir in hot water until blended; add additional water 1 tablespoon at a time until spreadable. Spoon frosting by tablespoonfuls over candy bars just until bars are covered. Spread remaining frosting on side and top of cake (thin frosting with additional water if needed to spread easily). If you have only 2 pans, spread one-third of the batter in each of 2 prepared pans. Cover and refrigerate remaining batter while the first 2 layers bake. After removing cakes from pans, bake remaining batter in one of the pans after it has cooled. The third layer may need to bake 1 or 2 minutes longer. A correctly prepared cake pan keeps the cake from sticking. When making most scratch cakes, grease the bottom and side of the pans and dust each with about 1 tablespoon flour, tapping out the excess.